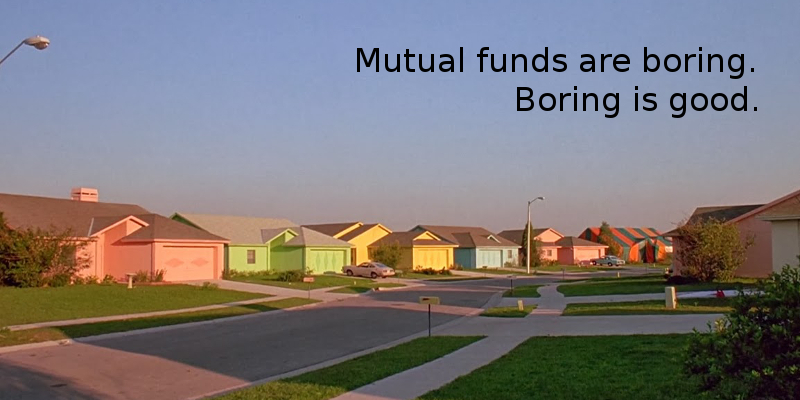 Mutual funds are profoundly boring, although their ETF cousins have been known to be a little saucy. As an investor, you probably have a vague feeling that by buying mutual funds, you’re performing the financial equivalent of buying a pink tract home and driving the same car to the same factory job as everyone else in the neighbourhood. I’m going to say something unfashionable, but by no means original: if you’re looking for excitement in your investment strategy, you’re looking in the wrong place. Go get a hobby. It matters how you invest your money, but it matters more that you invest it at all, full stop. It’s easy to get so lost in the array of investment choices laid in front of you that you develop a burning case of analysis paralysis and refuse to settle for anything but The Best Investing Strategy Ever, holding onto (or worse: spending) your investment dollars until you’ve found a surefire way to make the absolute most amount of money on every dollar you save. That strategy, The Best Investing Strategy Ever? It doesn’t exist. The only way to know absolutely that an investment strategy is “the best” is if you have a door in your closet that leads to alternate universes, where every possible combinations of market events has a chance to happen and then be compared, and one particular strategy makes the most money every.single.time. Of course you’re not going go running to the bank to buy mutual funds; all they can sell you is their line of branded mutual funds, and just because RBC’s Canadian Index Fund tracks the S&P/TSX Composite best, it doesn’t mean the RBC International Index Fund track the MSCI EAFE best. Or for the lowest management fee, which means that unless you’ve got yourself a Bankosaurus Rex, or until embedded commissions are banned, the bank will be leaning on him heavily to talk you out of buying index funds. Permit me to cheerlead: you can do it. It’s not hard, there are multiple confirmation screens, and the phone is right beside you. There’s got to be someone you can call (coughmecough) to walk you through it, or a book you can read (I whole-heartedly recommend (UPDATED) The Value of Simple that can push your confidence just over the line just far enough to pull the trigger. *Actually, I only wake up in the middle of the night if one of my three monsters kids wakes me up. Other than that, I sleep the sleep of the righteous and boring. **What? You think bankers and mutual fund reps don’t make mistakes? It is to laugh. Ha.